Which Is Better: Fancy Bacon Egg & Cheese or Regs Bacon Egg & Cheese? A recent Pete Wells column in the New York Times raises an important question: what are nice things even good for? Not, Wells argues, for standardized populist breakfast classics, such as the deli bacon egg and cheese. The good old regs BEC, and the no-name NYC bodegas that make them (as well as the equivalent trucks and diners providing breakfast tacos and biscuit sammies that serve as the deli BEC’s regional counterparts across America) are happily basic and anonymous, providing pleasure rather than seeking fame. 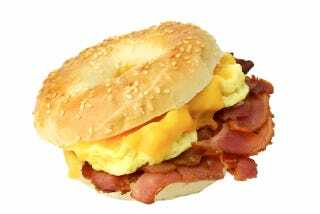 The great virtue of the bacon, egg and cheese on a roll, or its variations, is in what it doesn’t do. It doesn’t divide New Yorkers by class, income or neighborhood. It doesn’t seek publicity. It doesn’t convey status or bragging rights. It just conveys nutrition and, if you need it, settles your nerves. It is a secret handshake that New Yorkers exchange, not with one another, but with the city. But what if you want a fancy brioche roll, manchego and Serrano ham? What if you want feta and lamb sausage? What if you’d rather have the feeling in your stomach be “interesting... was that halloumi?” rather than “I feel greasy... very cool”? What kind of sandwich guy are you anyway?